blowing away the cobwebs of this blog a bit and it’s striking how little has changed in the space of three years. in spite of struggles to push forward, the continual effort to tick off goals, and the general rinse and repeat that is daily life, at a fundamental level, I guess, people stay pretty glued to their core. that realization is a little disheartening, if somewhat unsurprising. I came across this idea recently that throughout the bulk of human history, change has been incremental, that progress proceeds in a series of “punctuated equilibria”. at a minuscule scale, I guess the same can be said of people. been thinking a lot about career and purpose lately and grappling with the general confusion that comes with the territory. the lack of a clear destination and a well-marked path to get there are disconcerting, anxiety-inducing (and sufficient to conjure mental images of desperately heaving into a paper bag). a positive spin on this would be laced with assurances that this is exciting, that individuals now have the agency to craft and own their own stories, that there is nothing better than a blank canvas. a more detached line of thinking would point to the privilege that allows such internal crises to be possible in the first place and how this is very much in line with broader generational trends (i.e. this is all a function of age, socioeconomic background etc.). I wanna grab both your shoulders and shake baby, Snap out of it! a la the arctic monkeys. and yet I revert back to the wish for certainty, for a clearly defined roadmap, for a way to bypass the route labeled growing pains. 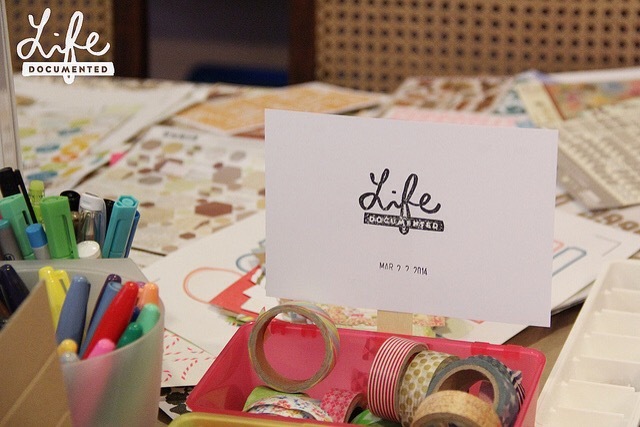 Since I’m still reeling from what felt like a whirlwind of events this weekend, I decided to write about the scrapbooking workshop I attended Saturday morning, hosted by Life Documented Manila (see: http://lifedocumentedmanila.wordpress.com/). I’ve always loved scrapbooking as an activity, but have yet to complete documenting yearly or travel-related highlights. My goal this year was to be more consistent on a somewhat more ambitious target– namely to document keepsakes collected from week to week. One method I encountered in a back issue of Creating Keepsakes that I thought would be ideal for that purpose is pocket scrapbooking. 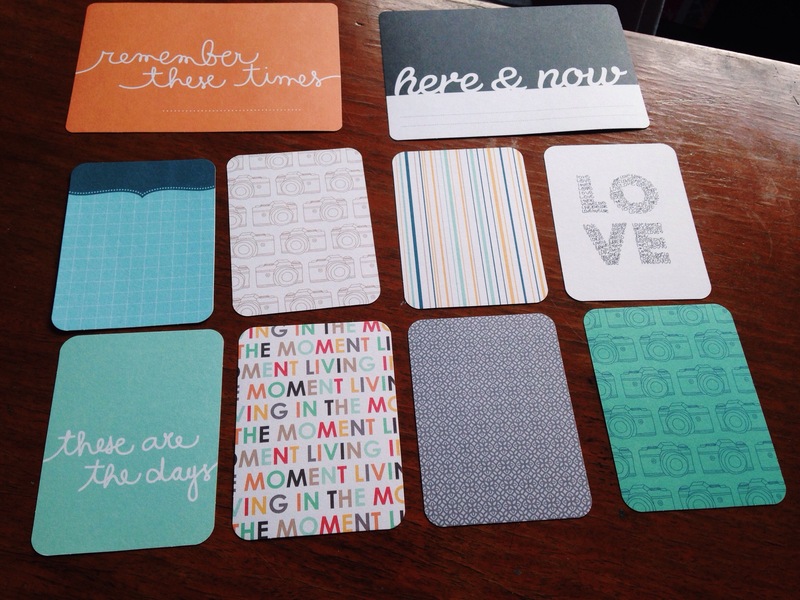 Essentially, you place pictures, journaling (brief descriptions/snippets of events) or mementos in page protectors in various sizes. 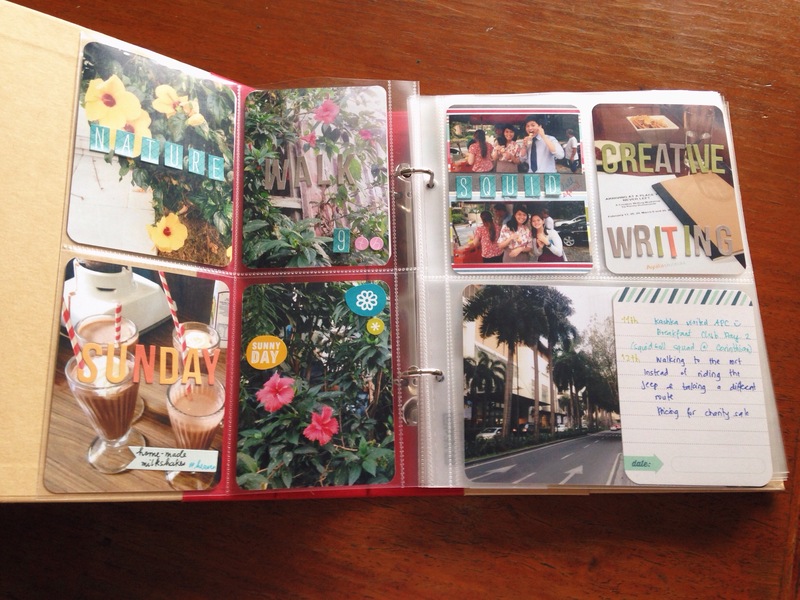 This type of scrapbooking is more conducive to sporadic documentation and has a lot of visual appeal. 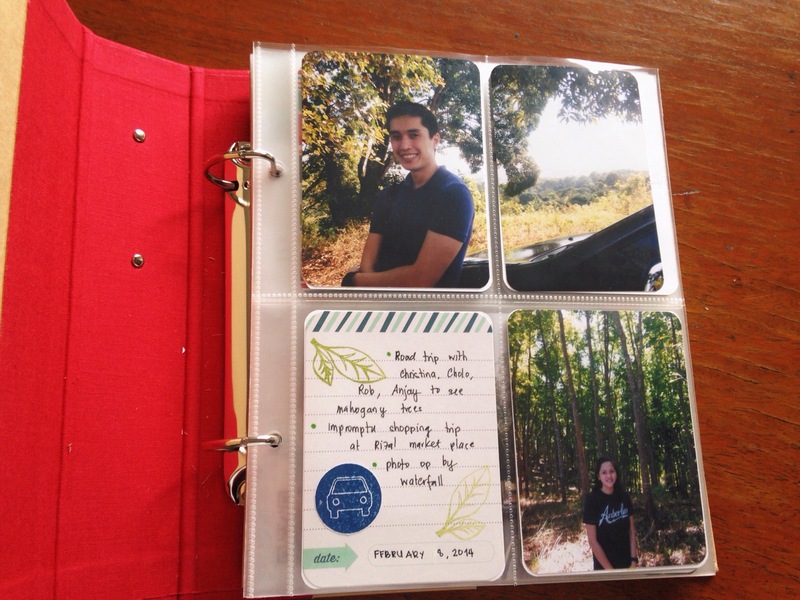 Unfortunately, the supplies I’ve encountered in craft stores have been pretty limited as far as albums and page protectors go — the best I could find was a clear book from Muji and protectors with business card size pockets. Luckily, I finally got some of the materials (album, page protectors, starter cards) during the workshop. We were given about an hour and a half to put together our pages, using some of the materials they had there as well as pictures and supplies we brought with us. I attempted to scrapbook my weekly highlights beginning the second week of February. My first page used one journaling card from the Project Life Jade Edition set. The blue car (on the 3rd pocket) was actually a stamp cut and pasted on from a blank index card. The leaves in the corners were stamped on as well. (One of my key take-aways from the workshop was learning about clear stamps that you stick on acrylic blocks — definitely to something to look out for on future trips to craft stores). I rounded the corners of the pictures using a corner rounder I got from Muji because I thought it gave the page a more polished look. The second spread made use of some of the alphabet stickers that they had available at the workshop. The mixing of colors (for the words Sunday and Creative Workshop) was a fluke (some of the letters were missing in certain colors) butI thought it actually turned out pretty well. 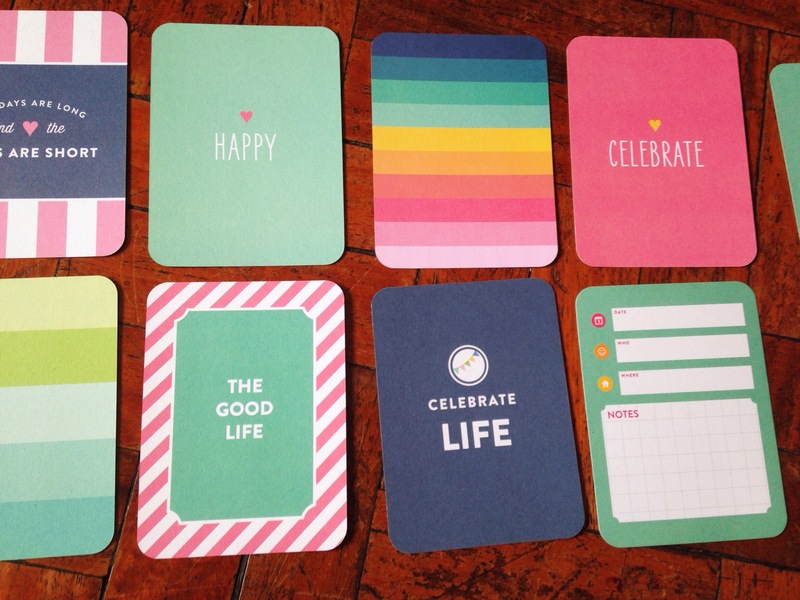 Cards from the different sets of Project Life were available at the end of the workshop. I couldn’t help myself; they were so well-designed. I gravitated toward the Fifth and Frolic set immediately. 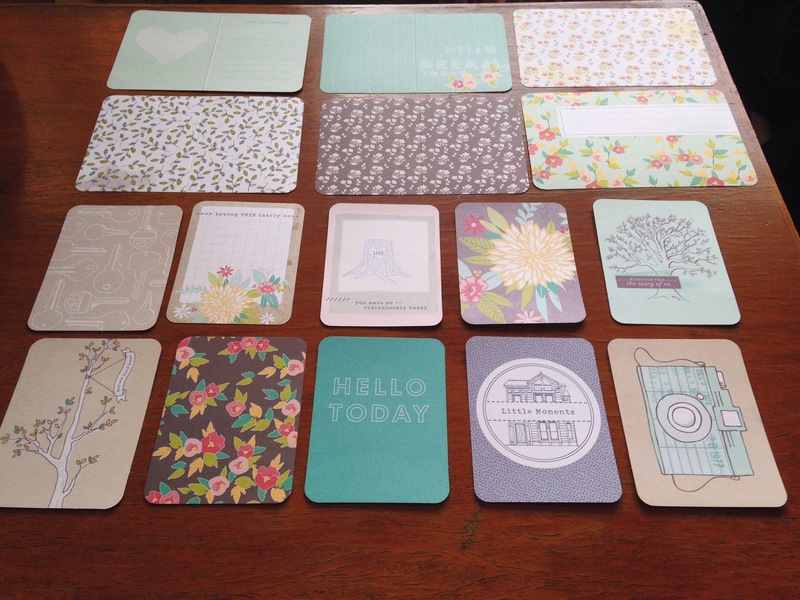 I fell in love with the flowery patterns and pastel colors and the nostalgia and optimism they evoke. The Strawberry edition seemed pretty fitting for March as embellishment for what is a celebration-filled month for my family (with birthdays popping up left and right). The Jade edition below was what I chose as my starter set in the workshop. I was drawn to the living in the moment theme and the cool colors. Finally, the Vintage Travel Edition cards were a no-brainer. 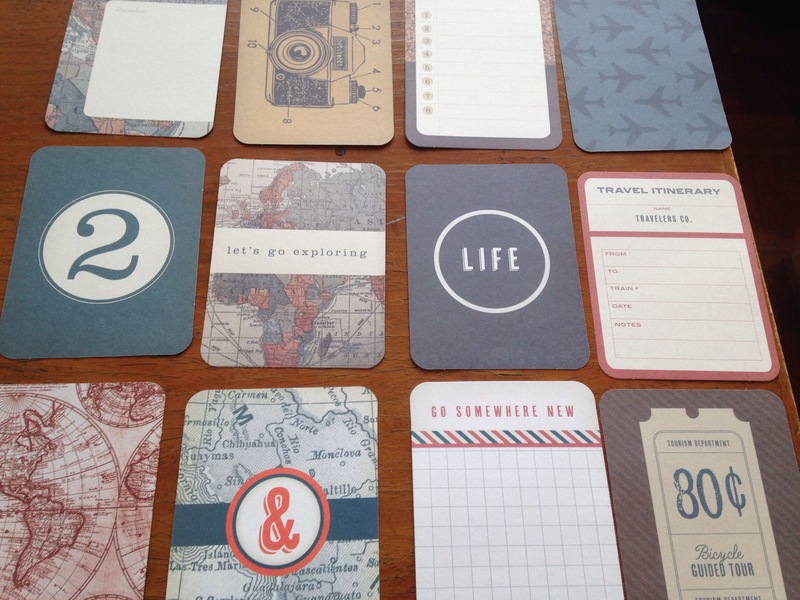 Trips and adventures are near the top of the list of things to be documented and these cards would complement travel-themed projects perfectly. Scrapbooking will always be a favorite craft/hobby of mine. It has its challenges, though minor (e.g. which scraps to include, which pictures to omit, how to fit everything in certain lay-outs). It’s an activity I can lose myself in and thoroughly enjoy. And to me the activity is rewarding in itself. 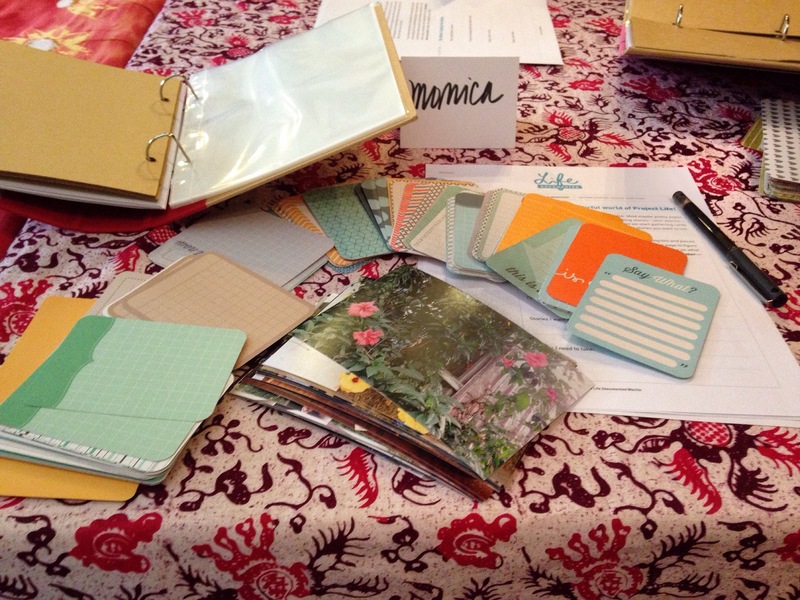 It occurred to me that scrapbooking carries a lot of the elements of Csikszentmihalyi’s concept of flow, which some have attributed as being a source of happiness. In a nutshell, the state of flow is entered into when one is completely absorbed by a certain task and is stimulated to work to the best of their abilities. It entails challenging oneself and allowing room for growth. (Disclaimer: I am far from an expert on the topic :))). 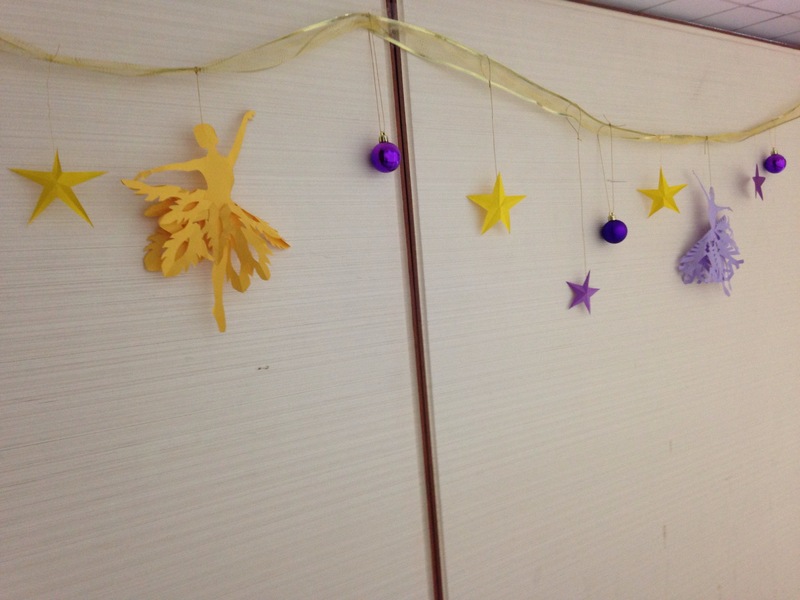 Decorating the office on a budget presented the perfect opportunity to be creative and resourceful with spare supplies left over from various projects throughout the years. 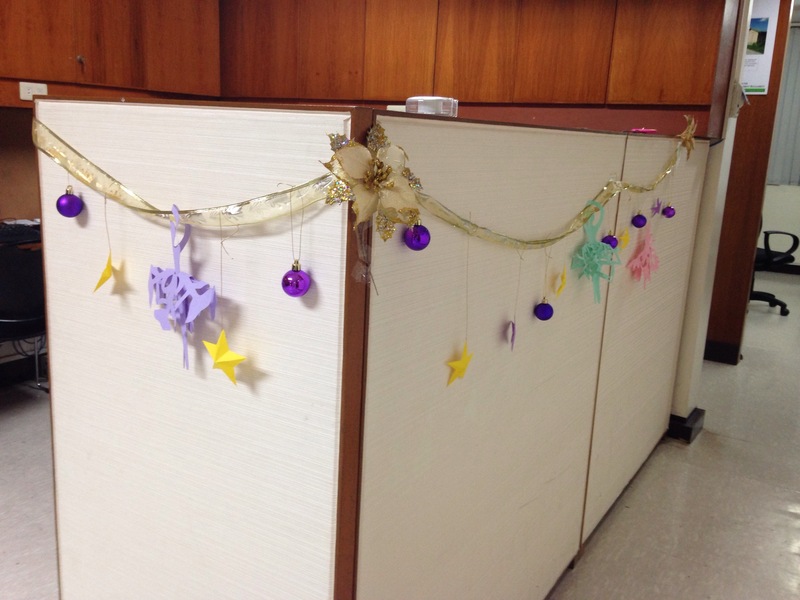 Money sponsored by our boss went towards getting Christmas ball ornaments, gold and silver ribbons, string and plastic flowers. 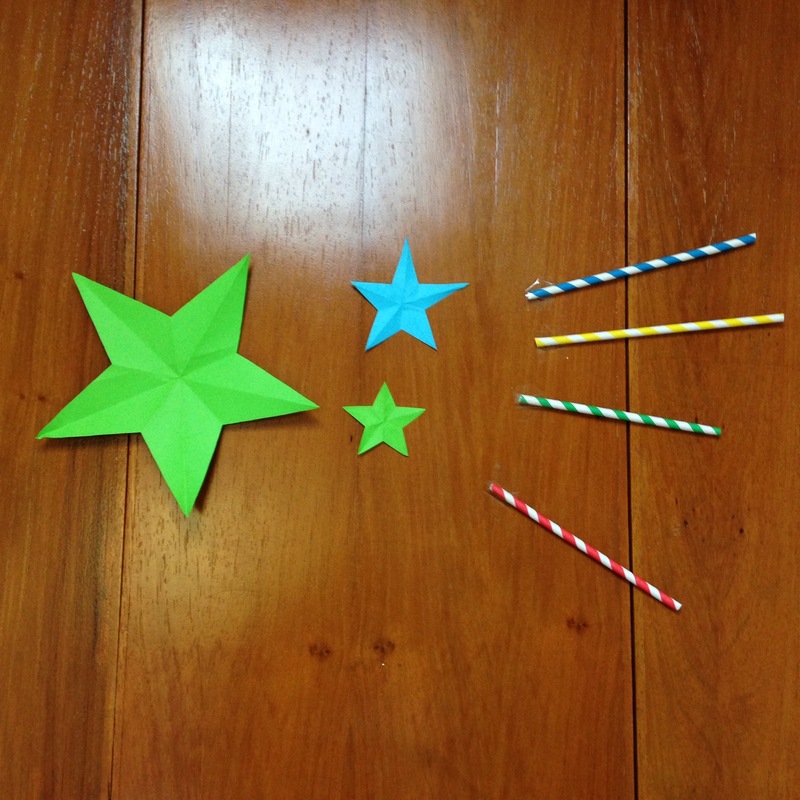 Other supplies used include colored paper, scissors, paper straws and tape. 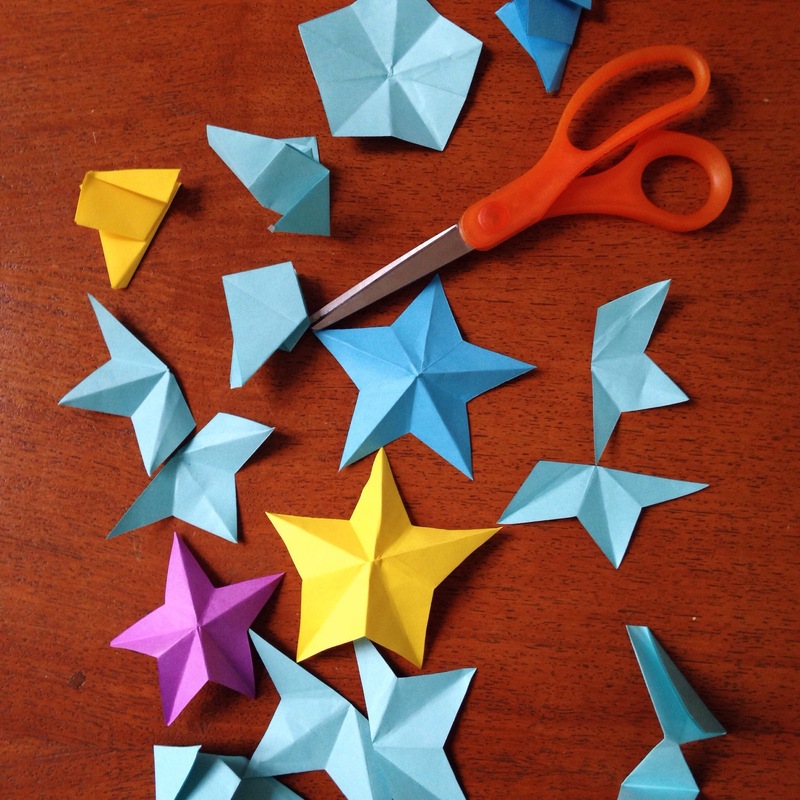 One afternoon, one of my officemates taught us how to make 3D stars. It took a few tries (and a few stillborns), but we got it in the end. 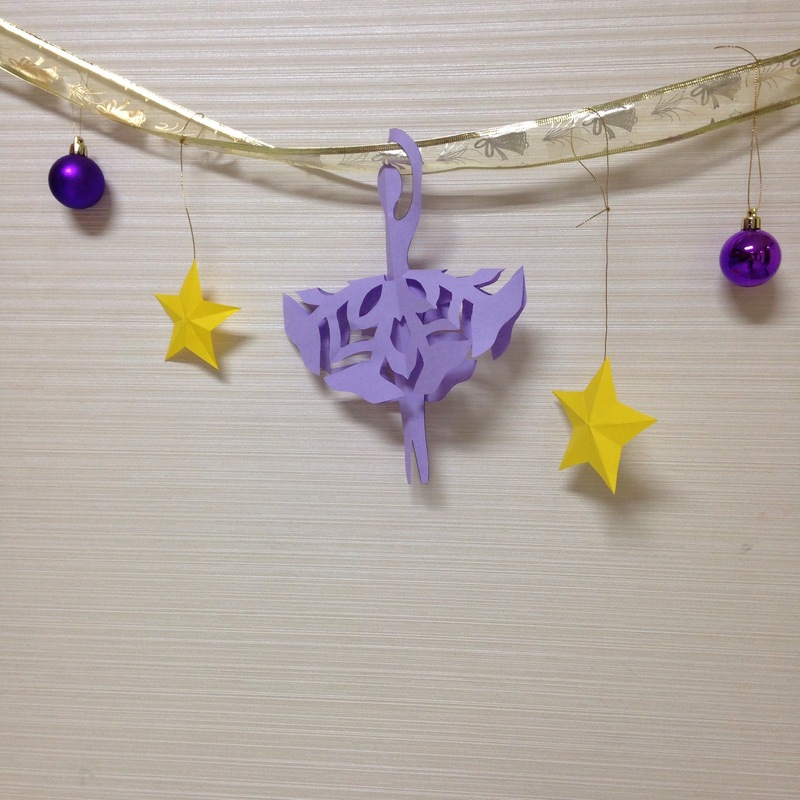 These are quick and simple ornaments to make and are a lot of fun once you get the hang of it. 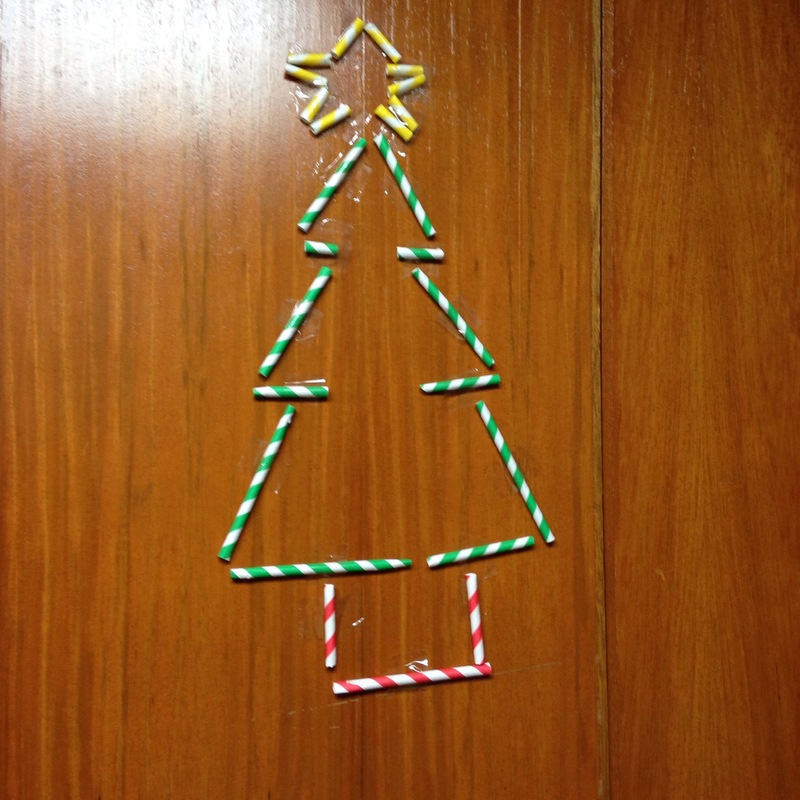 The most time-consuming part was figuring out the sequence of the ornaments to string up or add to the ribbons. Purple and gold was the chosen color theme for the front as purple is a favorite color of more than one office mate. 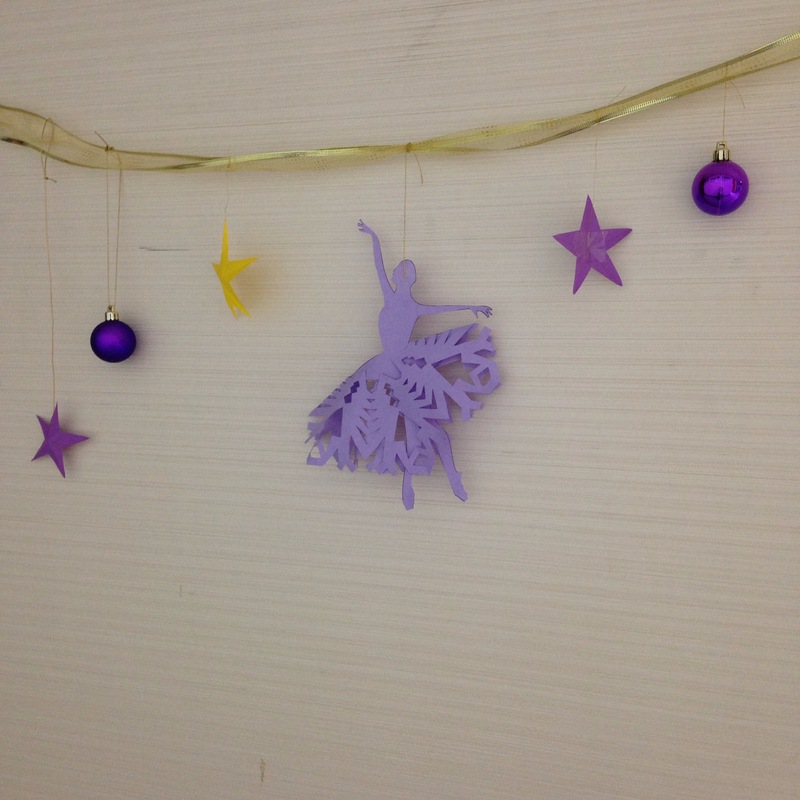 The ballerinas were cut out with a template we found on pinterest (see link below). 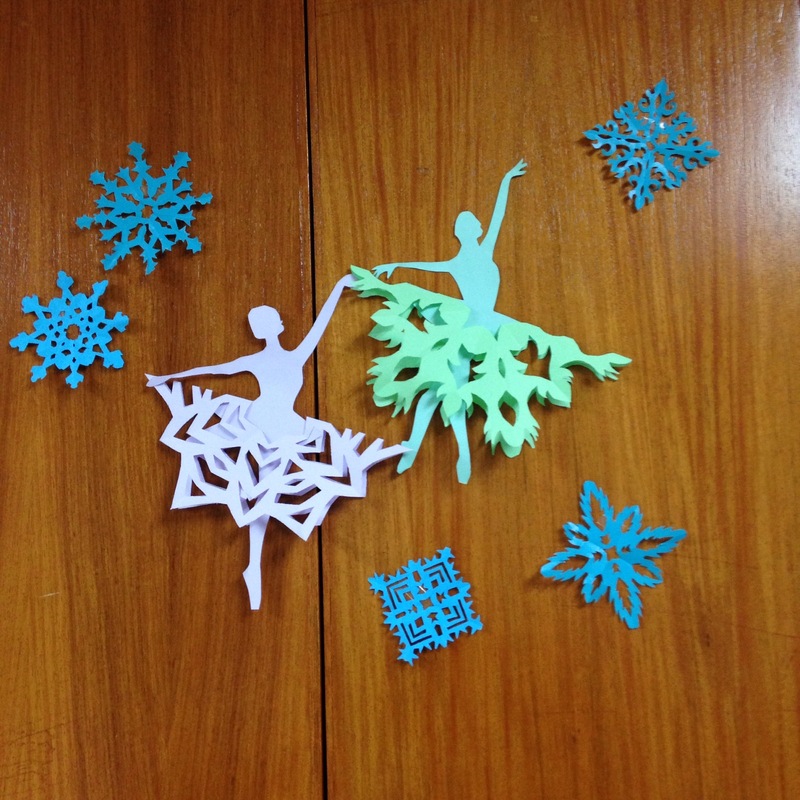 Snowflakes and ballerinas go so well together. 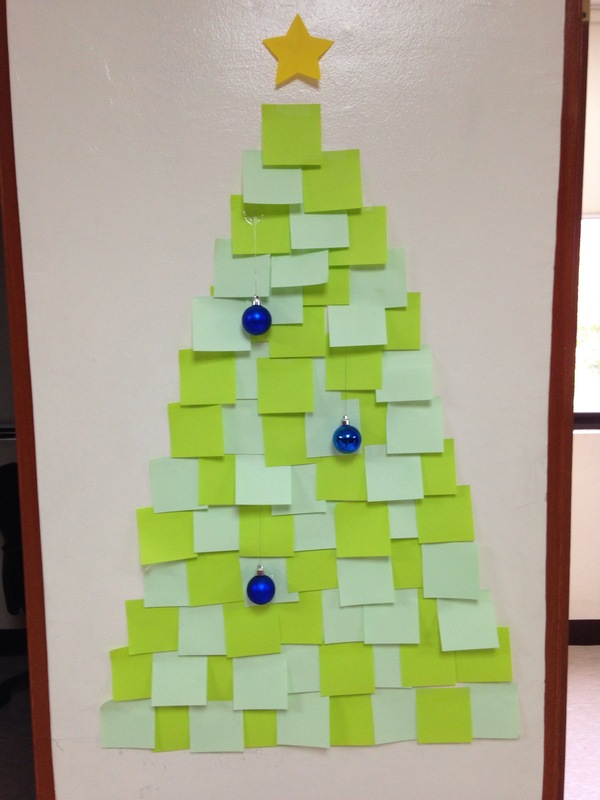 Another idea we picked up from pinterest was a post-it Christmas tree. We hung up some extra Christmas ball ornaments to decorate it a little more. I bought some extra string so the ornaments could be hung up at varying lengths. I had some left-over paper straws from my sister’s bridal shower. I cut these up and taped them into (crooked) shapes. Recycle and keep it simple. The holidays really are the most wonderful time of the year. There’s a post going around on the interwebs, a heart-wrenching snippet of love and loss, a glimpse into profound sorrow and tremendous resolve written by Sheryl Sandberg on the occasion of her husband’s 30th death day (see here https://www.facebook.com/photo.php?fbid=10155617891025177&set=a.404308695176.365039.717545176&type=1&fref=nf&pnref=story). Thoughts on the finite nature of life (of immense celestial bodies, of solar systems) creep into my consciousness on occasion, but rarely enough to inspire a dramatic change in lifestyle or a radical reconsideration of the life I lead. The fear of not living to the margins of possibility is pervasive though, humming constantly in the background like an antiquated air conditioner. I recently picked up the trendy manifesto on tidiness by Marie Kondo and was inspired to unearth possessions scattered and buried in different corners of my house. The process of piling together books hoarded through the slightly over two decades of my existence put into sharp relief just how little I have succeeded in becoming the future version of myself I picture in my head — the more knowledgeable, capable version of myself; the self who can speak Spanish fluently; the self who has acquired considerable and credible expertise in geopolitical topics and political economic thought. So many of the books signified aspirations — topics I had hoped to be better versed in but haven’t quite gotten around to throwing myself into. These were buried deep into the clutter, chaos and utter confusion that is my bedroom (and I suppose, by extension, my head). The moving piece by Sheryl Sandberg demands reconsideration of the very act of living and gives pause. On an admittedly more shallow side note, for all the wisdom that loss provides, I hope to never know grief like that. There are some things in this world I would rather not understand. I hope to never know true regret. To never feel like I lived less than I could have. I realized a backward approach to figuring out some of the things I want to fill my life with could be useful: I will regret never having finished Anna Karenina; I will regret not having lived in a different part of the world at least for a little while; I will regret never learning how to speak comfortably in Spanish; I will regret not finishing documentation of my family’s travels; I will regret never having made a bigger contribution to society — not living for something greater than myself. Recent events have made me question my happiness at work and overall satisfaction with what I do on a daily basis to a point of near-obsession. I hope that this predilection towards dissecting emotional events exhaustively and intensely fades away with age but for now I can only try to rein in the bad habit. Certain themes reappear again and again though that I think deserve more reflection — namely, the importance of autonomy, the elusive nature of engagement and the connection between work and self-identity. Stripping away the outward trappings of the job, I take comfort in the fact that at a fundamental level, we are all working toward a common goal: carving out a better society, chipping away at the corrupt and inefficient, even if at a microcosmic scale. We just differ (sometimes markedly) on the how of it. At its core, the frustration finds its roots in the struggle to create something of meaning, to forge something of value to some individual or some higher goal. I hope one day that desire is satisfied somewhat and that what I do day in, day out matters. For now, I just need to remind myself to keep my head low, hope to advance my center’s agenda and push on. some days require more conscious effort to be positive and optimistic than others. i really should track the number of times these fall on a monday for me so i can begin to work out a more targeted solution. on this particular monday though the friction was caused by a series of little things, a set of minor details and non-events to be honest that i would have shrugged off on any other day. of course, less than ideal sleeping habits over the weekend never set the stage for anything good. the train at 5:15 in the afternoon is a radically different space than it is just thirty minutes before. a slow start begot a slow end to my day so i caught the train at a low point (on its own version of a monday). while pressed against backs and other body parts, with elbows lodged into places i really would have rather not had them lodged into, with sweat and snippets of phone conversations shared and mixed i thought about how manners demanded space and how that seeped into language. cold and civilized are tied to a notion of distance. these are nowhere to be found in cramped spaces, in hot and humid vestibules with intimacy imposed. sometimes i wonder why it’s so easy to get worked up about things that have absolutely no bearing on the grand scheme of anything. are misplaced emotions but intangible appendixes floating around in the universe? what are they for? and can they be removed surgically once they begin to foment infection and disease? while i rage against stifling trivialities on days like these, there is always a distant voice of reason that calls for an end to such self-indulgence. my worries and anxieties are almost always ill-founded and are a privilege in their own way (slightly higher up maslow’s hierarchy that they need to be dislodged every now and then). it’s tempting to quash that voice on some days.